An Englishman in Colombia: Getting There! 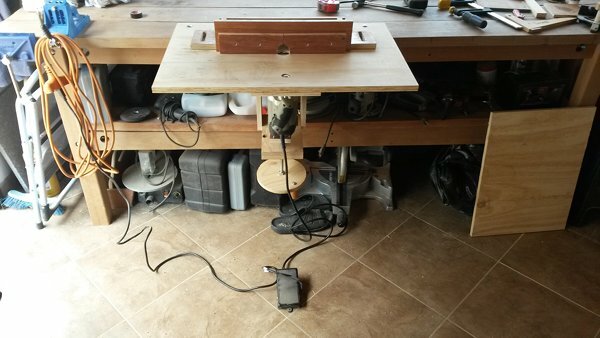 Today, I stopped on the way back from Physio, and bought the bolts to attach the router table to the bench. 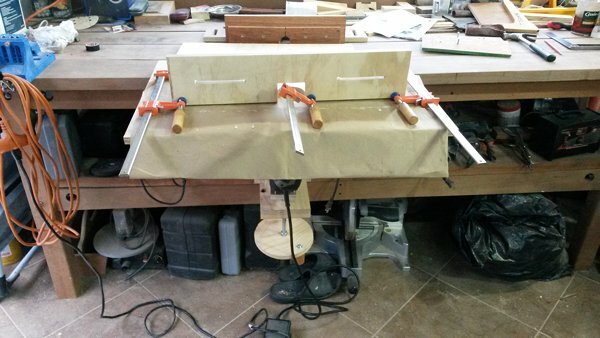 Back home, I clamped the router table to the bench, I had intended to use three bolts, but in the end two, with wing nuts were sufficient. I think I might end up shortening the threaded rod, I have to bend right down to get to it, and there is plenty of spare, but it works great,it is also very sturdy. I tried out the old fence, it would have worked, albeit a bit on the short side, but whilst I was building a new table, for the time it takes, I might as well build a new purpose fitting fence. I had just enough plywood left over for the main part of the fence. I also had to get around another problem, my router does not have a permanent on switch, so I used electrical tape to keep the trigger in the on position, and looked out my foot pedal, which I placed between the router and the mains, the router now only works if my foot is in the pedal, a good safety measure. 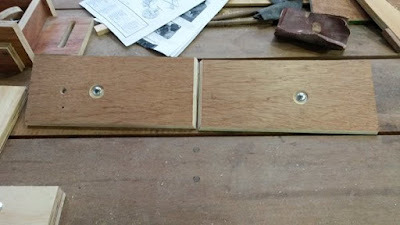 I cut the opening for the bit, using the band saw, and the slots for adjustment, I drilled a hole at either end, and cut the slot with the jigsaw, ready for 1/4" bolts. 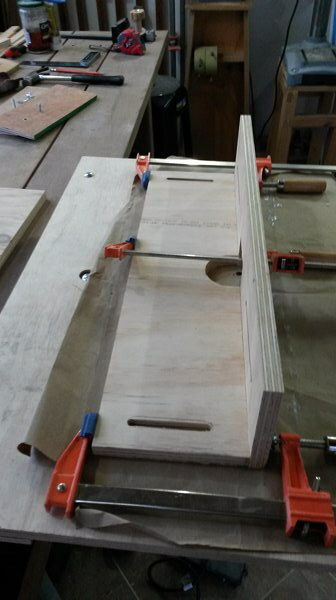 I have glued, and clamped the fence together, and tomorrow I will brad nail it, and add the rear supports using pocket holes. I cut a 30° reveal along the bottom to stop sawdust / shavings blocking the work-piece. Finally today, I cut the sliding face fence, putting a 30° angle both at the opening to the bit, and again also along the bottom. I used scrap 1/2" ply for this, hence the extra holes, but they won't have any detrimental effect on it's use.